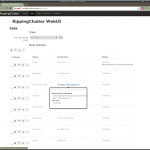 RippingCluster provides a web interface for managing a cluster of nodes for transcoding DVDs. The application provides the means to list available sources and prepare a list of titles to rip over a collection of nodes using HandBrake and Gearman. Multiple machines can participate in transcoding jobs using a worker daemon. Single WebUI to prepare and manage jobs. Batch multiple titles from a single DVD source (perfect for TV boxsets). Select audio and subtitle streams to include with the rip. View or clone a copy of the Git repository from GitHub.